Wow, what a year it’s been! DVD keeps revealing new treasures, while high-definition really took off. That’s right — just when you thought your DVD collection was nearly complete, some old favorites finally saw their official DVD debuts, and the high definition age arrived to tempt us to purchase even mediocre movies just so that we could ogle them in better than ever resolution. Last year, we had just launched Animated Views, and had no time or energy at year-end left to do a planned annual wrap-up, but this year we were thrilled to revisit the outstanding year that we had enjoyed in the digital disc world, not to mention a strong twelve months for theatrical releases. There were winners and stinkers, and we hope to point out as many notable discs and films as we can in this list. Here are Rand and Ben’s DVD picks, plus James’ review of the theatrical year. You’ll find live links to all our archived reviews, and if we didn’t get a chance to say what we thought there’ll be a link to Amazon, where you can help us keep the content coming by supporting Animated Views and purchasing your animated entertainment from there. We’ve had to plow through an enormous amount of quality releases – and we’re still catching up! – so there are still some full reviews to look forward to, and many more to come in 2008! A hand’s down favorite! Both reviewers are biased here as the sailor man is a much-loved character, but Warners really did do him proud in an excellent package that left almost no stone unturned. 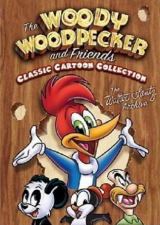 The cartoons – with their Paramount logos back in place after a fortuitous deal that saw that company issue an old John Wayne western with its original WB shield intact – are among the best ever produced, the video clean-ups were very nice, and the special features, including some really good documentaries, seemed to have no end to them. What would have made it perfect? 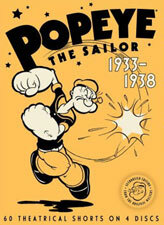 Adding a year’s worth of shorts to include all three of the color featurettes (Aladdin will have to wait for seconds, though to see Popeye meeting Sinbad and Ali Baba’s Forty Thieves in beautiful restored Technicolor is worth the price of admission alone), and a spinach-powered selection of image galleries would have provided insightful context. It’s hard to complain, though, as Warners have truly put together the classiest release of the year in gorgeous non-clipart packaging that’s too easily overlooked and taken for granted. We were totally bowled over by this set, and now Volume 2 can’t come fast enough! Read the full Animated View here! The Walt Disney Treasures are a yearly staple and fans were rightly overjoyed to find they would continue this year (and next! ), so while this isn’t the most packed set of the year, it’s the most unlikely. The sheer corporate politics new Disney chief Bob Iger went through to bring Walt’s first animated star “home” could go down as the stuff of legend, and that the Studio has actually done something with the property rather than let it lie as a museum legacy piece is commendable. 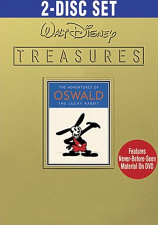 It’s also among the rarest stuff you’ll see this year on DVD, and apart from a featurette exploration of what it took to get the Lucky Rabbit back, the topper is Leslie Iwerks’ exceptional The Hand Behind The Mouse feature documentary, saved from the VHS doldrums to join similar fare Frank & Ollie and Walt: The Man Behind The Myth on DVD. Coming on the same day as other recommended titles (more Chronological Donald and Disneyland sets), this is a truly special release, even getting its own gold-colored tin instead of the usual Walt Disney Treasures silver. We usually prefer packaging to stay consistent, but in this case the color switch truly recognizes just how special this collection is! See above! Universal are not a company known for doing anything in animation if it isn’t riding on the back of franchised cartoon dinosaurs, and they’ve left their classic characters out to dry for far too long. Big thanks to Jerry Beck for convincing them to do something classy with their library of Walter Lantz shorts including, would you believe it, more Oswald from his later period. Some of the print quality might have been questioned, but overall these were top-notch transfers of good enough quality material, with really eye-popping colors (and no DVNR). This release really did come out of nowhere, and Universal could easily have simply repackaged their earlier Columbia House collections, but they didn’t. They packed in 75 cartoons (including a lovely amount of cartoons NOT featuring ongoing characters), a choice selection of intelligently presented bonus content and some very fun packaging. What else could anyone ask for? More in a second helping? Sure! Volume 2 has just been announced for next April! Possibly warranting a higher placing here, we’ve been slightly swayed by so much rare and unseen material featuring Popeye, Oswald and Woody making their way to disc that it’s shunted Bugs and company down a notch or two. 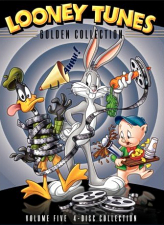 While The Looney Tunes Golden Collection: Volume Five did feature great cartoons and the usual wealth of extras, there wasn’t too much to genuinely surprise us this year. 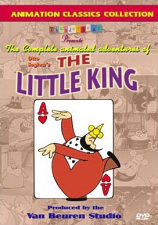 It’s still a great addition to any library, but this is the fifth time around, the contents were not as strong and the Extremes And Inbetweens documentary, despite being very valid and welcome, is available elsewhere (now very cheaply) and was included over other rarities, with too much emphasis on Chuck Jones again, who was otherwise undervalued in this collection. An essential addition, to be sure, but it doesn’t quite beat the other debuts this year. 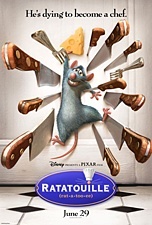 Until Ratatouille came along, this filled the gap of reaching parts other CG animated features just don’t usually reach! 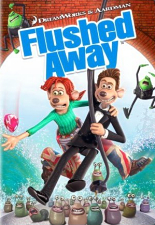 A vastly entertaining movie, combining Aardman’s strong story and comedy timing senses with DreamWorks’ modern CG techniques, to surprisingly good effect, Flushed Away did not deserve the drubbing it got in theaters from audiences and, sadly, its distributing Studio. While Aardman’s own UK market got a slightly more stuffed DVD, it wasn’t by far and for a movie that “failed”, DreamWorks at least did right by it on disc, with a good widescreen presentation for those that sought out that preferred version, commentary, a couple of run of the mill but enjoyable featurettes, and a healthy amount of actually more than half-decent DVD-ROM games and activities! The offbeat movie of the year that proved animated penguins can come over as genuine on the big screen and don’t need all that creepy Happy Feet fakery to work in CG. It proved that Open Season was a false start for Sony’s fledgling animation studio, and set their partnership with Imageworks up as the one to watch. While their work on SFX movies Spider-Man 3 and the awful Beowulf (where for art thou, Bob Zemeckis?) continues to frustrate, they made leaps and bounds here, coupled with a delightfully mature tale that consistently entertained and enlightened. 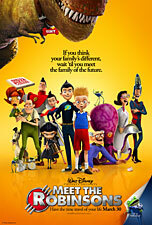 As with Flushed Away, the Studio backed the DVD (look for the widescreen edition) with a solid listing of full service supplements, including the original short The ChubbChubbs and a new outing for the little sci-fi critters, again proving that a movie needn’t be a smash to subsequently make up a good value disc, revealing the major blockbuster success stories of Disney/Pixar and DreamWorks this year to be even more stingy DVD distributors than we thought (head’s up Ratatouille and Shrek 3)! Views and buy from Amazon.com now! Warner continues to put out classic Hanna-Barbera on a regular basis, making children of the Sixties and Seventies very happy campers. 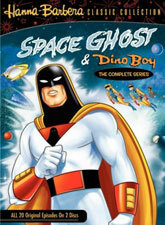 We were tempted to give a spot on our list over to the surprising release of Wait Till Your Father Gets Home, which itself had a very strong DVD set, but it was too hard to ignore the enduring appeal of Space Ghost. This landmark program ushered in the age of the superhero on Saturday morning, and the designs of Alex Toth set the standard for the next decade of adventure cartoons. The 70 minute biographical documentary on Toth is a very tempting offer even for a non-big fan, but for his biggest fans it made for a spectacular extra feature, making up for the lack of any actual Space Ghost extras. With the concurrent release of Birdman And The Galaxy Trio, we’re hoping sales for the two sets were strong enough to mean more Toth goodness in 2008. Without question, BCI have been doing an amazing job with their Filmation titles, reaching far into the vaults to put together packages that should make the majors (especially Disney with their episode-only DuckTales collections) feel very, very guilty. We wrangled on which BCI title to put on this list, as many of the collections have been impressive, but we settled on BraveStarr due to its inclusion of the little-seen origin movie, and a nice set of extras that placed the show in context as the last of the Filmation era. The full-length group audio commentary on the pilot is one of the best we’ve heard. 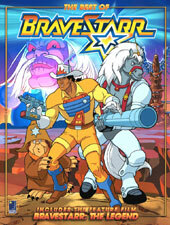 We almost went with Lone Ranger/Zorro: Volume One, as it had a couple of the better-remembered (and animated) shows that BCI archived for us this year, but its extras couldn’t match the Best Of BraveStarr set. 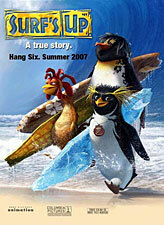 What, a Disney video sequel in our top ten for 2007? This one was hotly debated, but we snuck it in at the lower end. 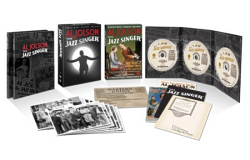 Though the DVD wasn’t exactly packed, it was created directly for the medium, which should count for something and shows how important DVD has become to the Studios. Cindy III more than made up for the dreadful second outing, which was nothing more than three episodes of a failed TV series proposal. A Twist In Time jumped the level of the DisneyToon Studio’s artists to, if not the feature level of the Nine Old Men, then at least a rival for the 1990s artists, with animation on par with the near feature status of The Lion King 1½ and the Bambi midquel. 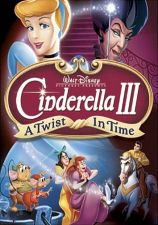 And Cinderella III deserves kudos for its unique story angles – not always successful but presenting a new twist on a classic movie. What it may lack in its opening moments it more than makes up for with a terrifically exciting climax. With DisneyToon now shuttered, they deserve to be remembered for when they got it right in a difficult situation: following up a Walt-era classic, they held their own with this one. Our last spot goes not to a specific DVD, but to a duo of self-funded small companies that animation fans owe a big debt to! Although their individual releases would usually rank well higher on this chart, we decided to go for a tie in the “last but by no means least” department. Steve Stanchfield’s Thunderbean and Ray Pointer’s Inkwell complement each other in a number of ways, with Pointer restoring pre-sound shorts to professional presentation and Stanchfield looking at later era sound cartoons from the “whatever happened to” files. Read the full Animated View on The Little King here! While Thunderbean’s Cultoons Volume 2 and Inkwell’s Alice In Cartoonland discs warrant high praise for making previously unavailable material more widespread, if there are two titles that we reviewed this year that push these guys into the top ten, it’s Steve’s The Animated Adventures Of Otto Soglow’s The Little King, and Ray’s The Legendary Laugh-O-Grams: Fairy Tales By Walt Disney; both of them bringing back much talked about but rarely seen collections in superb editions as good as any of the major Studios would handle them. Long may these two fine gentlemen continue their sterling good work, and long may we continue supporting them. It’s real treasures like these that make collecting DVDs fun and very, very rewarding. Read the full Animated View on Laugh-O-Grams here! 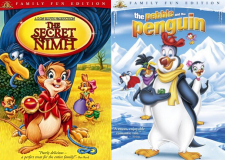 Don Bluth finally gets some just recognition for his early work in a much anticipated release for his first feature, NIMH, while his producing partner Gary Goldman got to fix what he could on the much maligned The Pebble And The Penguin (what can we say…it was a good year for animated penguins!). With an over reliance on set-top games, neither discs were as full with the knock-out collectors’ material on such past Family Fun Editions as (the non-Bluth) FernGully and his own Anastasia, though NIMH especially narrowly missed our top ten with the additions of an insightful and relaxed audio commentary from the pair, both valid aspect ratios (open matte negative and theatrical widescreen) and a short but informative featurette. At low list prices, these were great value reissues and we hope to see more in the Family Fun line. Some old and new in our choice of the short compilations from the year. 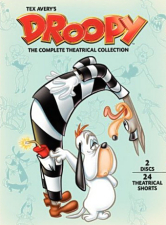 The Droopy Collection, while presenting us with both Tex Avery’s bloodhound cartoons and those from Mike Lah that continued the series after he left, suffered immeasurably from frankly sloppy transfers and some of the heaviest uses of DVNR yet seen, which actually didn’t seem to remove any of the bigger scratches but surely rubbed out some valid animation, marring this otherwise great collection and simultaneously rubbing it out of our top ten. There were also image concerns with the Pixar Shorts Collection, with the disc’s documentary featurette curiously featuring clips from much better looking editions of some of the earlier films than were included on the disc itself. That much of the material was previously available spread throughout Pixar’s other DVDs, and the content proved just too insubstantial to make an impact, especially at a list price which was ludicrously overmarked by at least $10 for less than an hour of entertainment. A couple of vintage selections, these discs didn’t make the final cut for various reasons. The Last Unicorn was a much requested fan favorite, and it finally made its way to stores in a 25th Anniversary Edition with some welcome extras, even if it was a bit of a mixed up final result and Lionsgate’s disc came mastered from a PAL print rather than a native progressive film transfer. Lionsgate also repackaged their three Chuck Jones Collection titles (Rikki-Tikki-Tavi, Mowgli’s Brothers, The White Seal and Jones’ Cricket trilogy) into a single disc reissue, going the extra mile to include a short retrospective on Chuck’s 70s output. Admittedly, this wasn’t quite enough to encourage another purchase for those with the three individual discs, but at under $10 it was a neat must for anyone coming to these specials anew and looking to complete his filmography on DVD. Word is that Warners are quietly working on The Phantom Tollbooth, so Mr Jones’ name is one we’ll likely see more of this time next year. 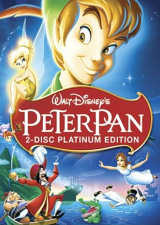 Peter Pan: Platinum Edition continued the Platinum trend of treating the film it was supposed to celebrate with clear disdain. 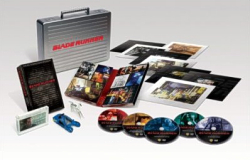 From a transfer with poorly adjusted coloring (something also brought to level at the same Lowry Images editions of the classic James Bond pictures) and some nonsensical extras (a repeat of the entire movie with subtitles instead of the collectors-preferred Walt-hosted, Pan-centric Christmas Show?) made this possibly the worst treatment given to a Platinum title, even beating out the weak Cinderella and Lady And The Tramp attempts. The Jungle Book: Platinum Edition didn’t fare much better on DVD when it debuted in the same Platinum line. Despite a nice restoration of the theatrical ratio, Walt Disney himself envisioned the film living on with television showings and had the film animated to an Academy aspect negative ratio. After years of suffering totally redundant dual aspects on many Disney DVDs – including unbelievably the use of a cropped print of Lady And The Tramp when an Academy “fullscreen” edition had been originally formatted by Walt himself – they dropped the ball big time here and only presented the chopped heads and legs edition. 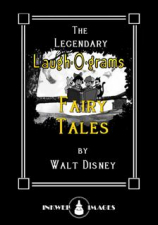 The supplements were so-so, but long gone is the time when one Platinum a year meant the quality and depth of a Snow White, Beauty And The Beast or Lion King. We’re not quite sure just what happened to theatrical animation this year, but most of it rested on cheap, unfunny fart gags. Open Season, released this year on DVD, even resorted to a character defecating on screen, blasting the “family comedy” marketed movie into quite another beast altogether. Happy Feet didn’t break wind as far as we can recall, but the story sure blew off and lost direction around the mid-way point. 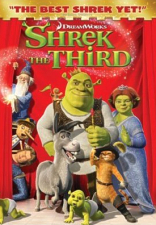 Finally, this summer’s Shrek The Third, just out on DVD, took burping to its logical conclusion and went all out on a character throwing up. Maybe they’d just read the rest of the script to this painfully uninspired yet implausibly money-making effort that surely marked the nadir point for DreamWorks. Just in time for Christmas, one of Disney’s most non-requested follow ups, Cinderella II: Dreams Come True (full review coming soon! ), comes back to DVD. While it’s not as painful to sit through as The Hunchback Of Notre Dame II: Quasi’s Revenge, which threw on abysmal animation on top of its poor plot and embarrassing songs, Dreams Come True at least upped the stakes of the DisneyToon animators and captured the essence of the original characters, if not a single sprinkle of the magic. Much better was to come with the second sequel, as evidenced by our “shock” inclusion above, but it’s a shame the Australian crew never got to unleash their imagination and clear talents on their own feature. This reissue is essentially a double-whammy: the second release for seconds that nobody asked for! Easily the best animated film of the year, and perhaps the decade – see our “Best Of The 2000s” article in a few years for confirmation! With Pixar (currently the undisputed premier animation studio) and Brad Bird (perhaps the finest animation director working today) at the helm it probably is not a surprise pick, but it did have a surprisingly bumpy road before it hit the big screen. Not that you can tell from the final product though! Beautifully written, lushly animated, vividly scored, and perfectly voiced. 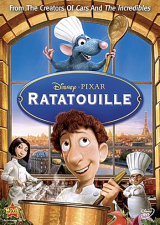 Ratatouille should be a revelation to audiences who missed the last golden age of animation in the early nineties, and instead were raised on the lowered standards of the past several years. It’s so unfortunate that this film had to come out at the same time as Ratatouille. In just about any other year it would have been a wonderful choice for top film. Infused with important elements sorely lacking in a lot of their competition – originality, great casting, beautiful animation, and a real sense of fun and excitement – Sony proves they aren’t just attempting to follow the leader. 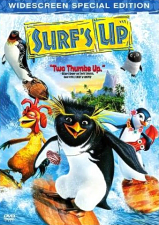 Of the three picks on this list, Surf’s Up takes the top honor of being the most rewatchable due to the pure fun and sheer enjoyment of the story and visuals. While the story was not as tight nor the animation as great as the above picks, it did have something no other animated film this year had – real heart. The film had several major problems – a script with a secret that kept audiences a little too much in the dark for a little too long, and a disjointedness that probably stems from some behind the scenes issues that weren’t as well resolved as those in Ratatouille were. But when it hit the right notes you could almost feel those flashes of old time Disney greatness. And with an emotional edge not seen often enough these days Meet The Robinsons shows that Disney may just be back on track (as further evidenced by the enchanting Enchanted) after a disappointing decade. And there we have it! 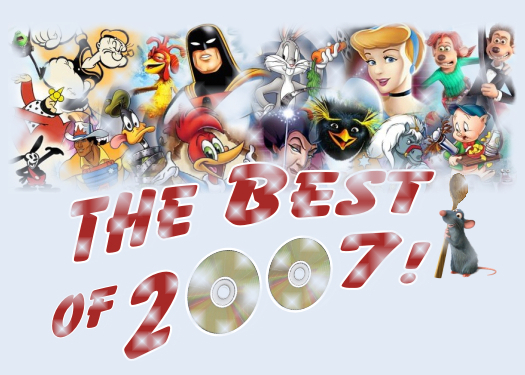 Whether you agree with our picks or not – and it was a tough choice this year with so many great releases – you’ll have to agree that 2007 was a pretty banner year for us toon heads! From surfing penguins and culinary cooking rats to vintage characters making their debuts for a second time, there was never a dull moment in mainstream theatrical animation or classic cartoons on home video, with television programming continuing to explode in all directions. Though we barely scratched the surface of what’s going on in independent and international production, these are exciting worlds rapidly rising in popularity and availability that we’re sure to enjoy more of in future. So “That’s NOT All Folks”…see you next year! – Ben Simon, Rand Cyrenne and James R Whitson.